The simplest way to add value to selfadhesive vinyl is to cut a shape out of it, and there is still plenty of business to be had in applications such as vinyl lettering that just require a steady hand and a sharp knife. However, an obvious step up from this would be to contour cut around a printed graphic, which allows for much higher margin jobs such as creating a sheet of stickers or the panels for a vehicle graphic. There are two approaches: an integrated print and cut machine, or a printer and standalone cutting plotter. Regardless, the main features to look for are the degree of downforce that the cutter applies, which will dictate which materials can be cut, and the type of cutting. The plotter should be capable of cutting right through the material, as well as through the vinyl but not the backing to create a peel-off sticker, as well as producing perforated cuts. He points out that integrated machines tend to be bought by smaller print shops, where space is often at a premium so a single machine offers a compact footprint. Roland sells several eco solvent printer cutters, such as the TrueVis VG, an 8-colour machine available in both 1625mm and 1371mm widths. It features a newly designed blade and can produce a cutting force of up to 500g, with a cutting speed of up to 300mm/second. There’s a lower cost TrueVis SG series, as well as the VersaCamm VSi series, both with similar cutting specifications as the VG series. For UV printing, Roland sells the VersaUV LEC, which prints CMYK plus white and clear. It can cut at up to 600 mm/ second and produce up to 500g of pressure. Mimaki has also added integrated cutting to its main solvent printer, to create the CJV300, as well as its entrylevel counterpart, the CJV150. They can automatically optimise the clamp pressure for cutting and printing and can even cut some thin materials before printing to avoid problems such as film separation. The Mutoh ValueCut 1300 cutting plotter can cut a broad range of signmaking materials ranging from self-adhesive PVC to sandblast, up to a maximum thickness of 0.8 mm. Mutoh sells the ValueCut series, which have a cutting force up to 600g. They use a drag knife and can accelerate from a standing start up to 4.2G. They take media up to 0.8mm thick and have a cutting speed of up to 1530mm per second. There’s a choice of three widths - 610mm, 1320mm and 1830mm. They come with Sai’s popular FlexiStarter software, which can add contour cutting lines to design files, as well as a reference mark for the plotters to know where to cut from. 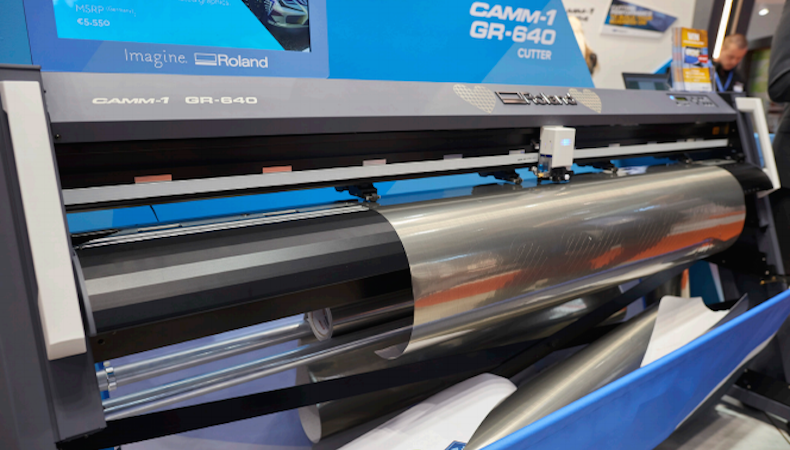 Roland has recently introduced a new GR series of vinyl cutters with a choice of three sizes – 1651mm, 1397mm and 1075mm. They come with an integrated stand for greater stability. They can achieve a maximum cutting speed of 1,485 mm/ second and up to 600g of downforce. They offer both kiss cutting and perforated cutting. They come with Cut Studio software, which can be used to put registration marks on the file, provided it’s printed on a Roland printer. There’s a Windows driver that allows printers from some other vendors, such as Canon and Epson, to print the cut marks. There are also plug-ins for Illustrator and CorelDraw. Mimaki’s main offering is the CG FX series, with a cutting force of up to 400g of pressure and cutting at up to 100cm per second. There’s a choice of 760mm, 1300mm and 1600mm sizes. They do boast an optical sensor to detect registration marks on the print. Mimaki has developed its own FineCut plug-in that works with either CorelDraw or Adobe Illustrator. Mimaki sells a second range of cutters, the CG-SRIII series, which apply more downforce - 500g – but with a slower speed of up to 70cm per second. These are available in 606mm, 1070mm and 1370mm widths. Summa has developed a wide range of well-respected cutters, aimed both at industrial and graphics uses. There are two main series for graphics users. The most powerful is the S Class 2 aimed at high production environments. There are four models, covering maximum widths of 84cm, 130cm, 145cm and 168cm. They have both a drag knife, that can produce up to 400g pressure, and a tangential knife, with up to 600g pressure. Cutting speed is around 141 cm/second. There’s also the cheaper SummaCut series, also available in four widths, ranging from 66cm to 164cm. These have a drag knife, capable of 400g pressure and can cut at 113 cm/second. Both series use an optical registration system to locate cutting positions. HP has also developed a print and cut solution, by bundling cutting plotters with its Latex 300 series printers. The plotters are branded HP but actually supplied by Summa. There are two solutions, based around the 54ins Latex 315 and 64ins Latex 335 printers. The key element is the workflow, which puts a code on the print so that the cutter knows where to work from. The workflow itself is Flexi Print and Cut from Sai. There are two main factors to consider. Firstly, there is a choice between an integrated machine or separate printer and cutter. This is mainly down to volume, with an integrated machine being a good starting point, offering both low cost and a small footprint. But higher volume users should consider separate devices, which will offer greater flexibility and productivity. The second issue is the workflow, with the printer having to be able to print the registration marks that the particular cutter is expecting. Bear in mind that the cutter will almost certainly outlive the printer, so the workflow for the cut marks should be independent of the printer or flexible enough to work with whatever printer you might buy in the future.